Four Titles Are Coming In Paperback! Thank you to everyone who reached out to say: “I love what you’re releasing, but what about paperback?” Well, getting paperback out in a more timely way meant changing my back-end systems. So I did. Yay! Now, I have more control over file production (Have I mentioned that I’m a control freak? I am.) 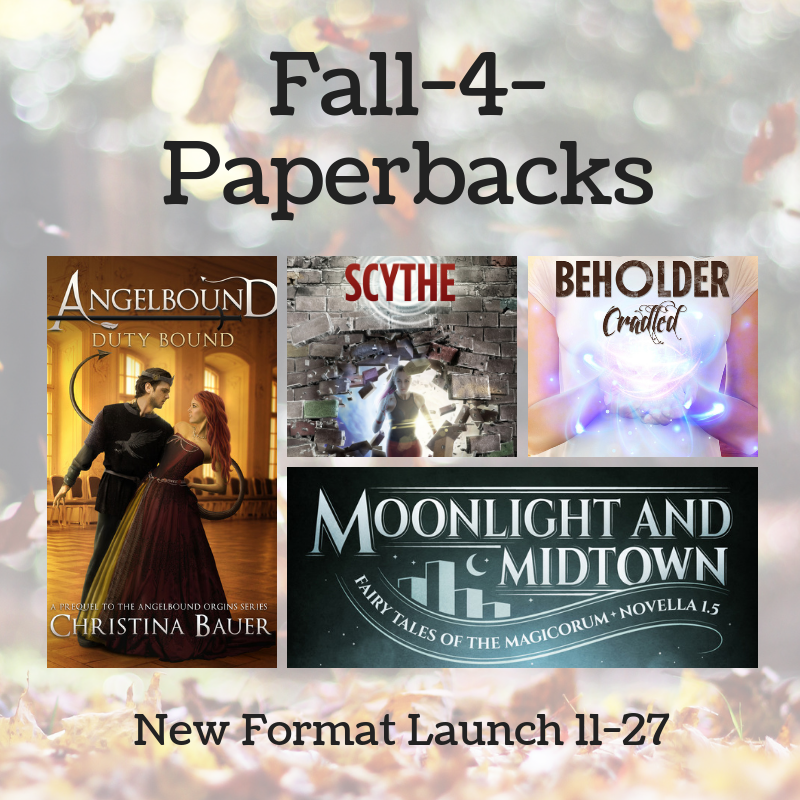 Long story short, I’m releasing four titles in paperback on November 27th! PROTIP: You may see these titles available earlier. 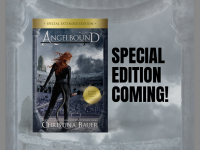 Unless you’re JK Rowling, retailers won’t hold off on shipping physical books until a release day; if the order comes in and there’s stock, out it goes!!! 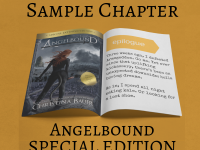 DUTY BOUND, Angelbound Origins book .5, the prequel told from Prince Lincoln’s point of view. Available in paperback at Amazon and Barnes & Noble. MOONLIGHT AND MIDTOWN, Magicorum Book 1.5. Available in paperback at Amazon and Barnes & Noble. CRADLED, Beholder Epilogue Book 5. Available in paperback at Amazon and Barnes & Noble. SCYTHE, Dimension Drift Prequel Novella 1. Available in paperback at Amazon and Barnes & Noble. Thanks again to all you lovers of traditional books! 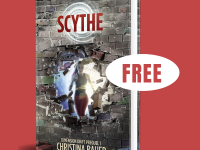 New Sample Chapter – SCYTHE!